What is the distance of the path A-B-C-D? 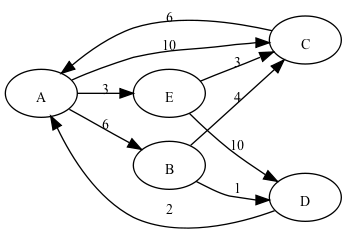 How many paths are there from A to C that are exactly 4 steps long? What is the distance of the shortest path from A to D? I reviewed three different solutions; they were all valid, reasonably well written. Two had proper unit tests, while the third was checked by prints in a "main". The authors tried hard to write a "good" solution. There were no long methods; all the logic was broken down in small methods. And yet, I was not pleased with the results. I was invited to speak at Better Software 2009, a conference that will happen in Florence on May 6 and 7. I will talk about “Growing a Team”, which is what happened in my professional life in the last two years. I will talk about what happens when you decide you *really* want a team that works well. I will not say “when you decide you want an *agile* team”; that is not the goal. The goal is to have a *great* team, in the sense that James Shore explains. Of course, the best way I know to go in that direction is to do Extreme Programming. My team started in 2007 with 3 people, and has grown to 12-13 people today. The growth has been along more dimensions other than size, of course. We’ve all learned a lot in these two years; the way we worked two years ago is not the same as how we work now. I’m flattered that I was invited, given the company I will be in: look at the speakers! I’m very much looking forward to this conference. I hope to see you too. We had three great editions from 2006 to 2008. But this year I no longer have the time to help organize the School. Vieri, who was an organizer last year, moved to Dublin. Federico is not, understandably, willing to organize without our help. What happened? Well, what happened to me is that I’m coaching a team of 12 people, and it’s more than enough to keep me busy. On top of that, I’m teaching a brand new class at Insubria this year. I hope I will have more time to do an Essap in 2010. You are currently browsing the Extreme Enthusiasm weblog archives for April, 2009.